TV news folk are well-equipped to shoot images of events happening right in front of them. We can produce pictures of fires or images of people talking with near perfection. But put us in a situation that requires us to make interesting the routine settings of real life, and our equipment sometimes isn’t sufficient. Real life tends to be much more predictable and stagnant. People sit in their dens and read books or watch TV. People sit in their cubicles and type. People sit around an awful lot. Real life is frequently all-but motionless. Which is why the guy in this photo brings joy to my heart. And the disembodied hand of the unseen person pulling the wagon. 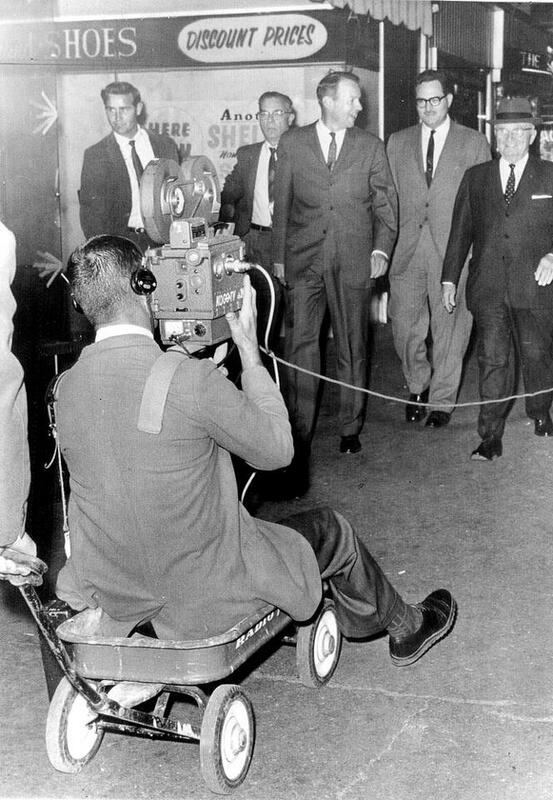 I’ve never used a wagon to give motion to a TV camera. I honestly doubt I could ever persuade a TV news photographer to sit in a wagon and allow me to pull him in it. But we do improvise. Put me in a room full of stockbrokers — who generally sit in chairs and stare at computer monitors — and I will almost always look for an office chair equipped with wheels. “Sit!” I’ll gently insist to a photographer. They’ll sit. I’ll push. The photog trains his camera on the succession of cubicles, while zipping past in his reporter-powered chair. I’ve also been known to use a hand truck for the same purpose. This is a bit scarier because the photog’s upright position creates a higher center of gravity, resulting in a more unstable balancing act. If you can sweet-talk a photog onto a handtruck, I recommend pulling the cargo rather than pushing. Always use both hands. The most commonplace poor-man’s jib is the automobile. Photogs mostly don’t like to shoot rolling shots through the passenger window, because they have less control over the composition of their shots. They’d prefer to stand or squat in the back of a pickup truck, which gives them the flexibility of composing shots from a 360 degree perspective. Unfortunately, all of this requires teamwork in the field. One-man-bands, or photogs working solo, would have to recruit an intern or a stranger for assistance. The explanation itself would be enough to spook most non-TV folk. The poorest of the poor-man’s jib is the walk shot. An item is fixed in a room; the photog stands back from some distance, then walks forward toward the item. The problem with this pertains to the makeup of the human body. Because God gave us feet and legs instead of wheels and axles, the walk shot tends to have an unavoidably clunky up-and-down quality that coincides with each footstep. It’s mostly to be avoided. Especially when there’s an office chair in the room. The photo comes from Amanda Emily’s Facebook page. She ID’s the photog as George Potter of KOGO-TV (now KGTV) shooting Harry Truman’s two mile morning walk in San Diego in 1962. She also compiles and blogs about vintage newsgathering images, on the blogroll to the right under “Feeding the News Beast.” Click here. It’s worth visiting. And of course, Lenslinger beat me to the punch writing about this photo, plus he has details on Potter. Visit his site here. This entry was posted in WXIA on January 30, 2012 by live apt fire. I’ve hooked Lenslinger up with details on George Potter himself since I’m too lazy to write a blog post myself. That’s actually a “Poor Man’s” Dolly. There’s actually a pretty easy way to flatten out a walking shot that they don’t seem to teach anymore: Take rolling steps like you’re in a marching band, but walk with your knees bent about 15 degrees. It’s a little hard on your ankles and makes you look foolish to spectators, but no more foolish than rolling around on a hand cart. I guess you have not tried a GoPro camera for such shots. The small HD-cam comes with accessories allowing it to be attached to pretty much everything to get the desired results.We have even mounted it on a remote controlled helicopter for over head shots. it is simple to use do even a one-man-band reporter, photographer, producer, etc can do it. I know its a dead thread, but thought I’d add anyway. I keep a skateboard in my go bag which works pretty well.